Julien Baker, Phoebe Bridgers and Lucy Dacus are some of the brightest songwriters of the moment with each of them garnering an rapidly swelling array of fans due to each of their relentless touring schedules and the acclaimed solo albums. This shared experience and overlapping of paths as they toured internationally has seen strong friendships form between the trio to the point that a supergroup called boygenius was formed, who have just released their debut, self-titled EP. 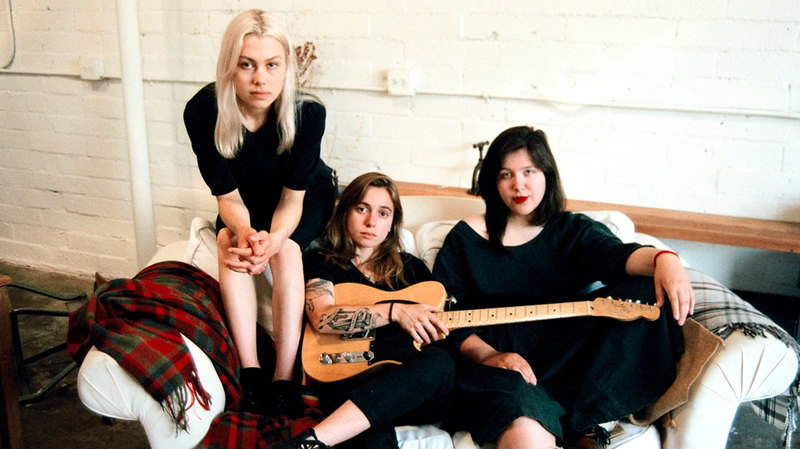 CHRIS HAVERCROFT spoke to all three members of boygenius prior to the release of the record and the tour that was the catalyst for the band. Catch Julien Baker doing her own show at Perth Festival’s Chevron Gardens on February 21. The idea of the three artists making music together is said to have been something that had been suggested to Dacus on twitter over the years, without any thought that it would become a reality. Starting as small project to record a song to hock at shows that they were playing together, it soon blossomed into a full songwriting partnership, with the band releasing their debut six song EP in November. boygenius captures the confessional style of Bridgers with the emotive Baker and the wit of Dacus to deliver a layered and deeply engaging release to add to their friendship and reputation. While the songwriters had crossed paths individually, the three of them had never been in the same room together until the writing and recording of the EP. The partnership formed over chance meetings and a string of email chains came to produce a stellar result as this 10/10 review attests. How did boygenius become a band, if you had never actually all been in the same room until you made the EP? LD: We all tour a lot, so we’d see each other separately in various cities. I met Julien years ago, and we have reconnected as we have played shows. You tend to be on the same schedule as people who are putting out records at the same time as you. Phoebe I hadn’t met until this year. We are all super busy so we have never got to hang out together, but have done so separately. We eventually made the time to make this album. JB: I had met Lucy and Phoebe separately and then we were all booked on a tour together. We were all excited as we are all fans of each other’s music even though we have never all hung out in person. We were thinking of a way that we could make the live set special and different to our records. We thought, should we do a cover, or release a single, or what should we do? After we had been contacting each other on an email chain for a while we decided that we wanted to find some time and record as much material as we could, so we shared some songs that were in various stages of completion. Due a magical overlap of the Venn diagram that is our touring schedules, we were able to meet in Los Angeles and record it. PB: We decided to do a tour together. We thought we would do a 7” that we would sell on the tour, but we ended up having so many ideas that we recorded the six songs that are on the album. We had maybe two or three songs that we wanted to get done, but when we met we had way more ideas and we ended up with 6 songs. It must be a change in tack to be promoting a whole new band when you are all still in the early stages of your solo careers? PB: It’s kind of magical because most ‘supergroups’ are from fairly established people, so it’s cool to do this pretty early. Julien and Lucy have two records and I have the one record. It is pretty special to be able to collaborate this early. Did you get together to write the tunes from scratch or did you bring fully formed songs? LD: A bit of both really. Each us wrote a song in our own time, and those were the three songs that were released before the EP came out, but we worked on arranging things together and made all the production decisions together in the studio. Then the other three which i think are my favourite songs, we all worked on once we got together in LA and I think that those are more special to me as I think we all put a piece of ourselves into each of them in the moment. We only planned for three songs, but the other three came as we were on a roll and feeling really comfortable. JB: We had all sent voice memos and demos of each other’s songs and then we had one day when we all sat in a living room and played through all of the songs so that we had a rough idea of the structure. Everything about the specific instrumentation really took in the studio. PB: I consider them both prolific, but I am not at all. It takes me so long to finish a song. Which i think can be good. I take my time and I tend to write them in order from start to finish which is very unusual. People tend to write what they are feeling and finish a song in a day, but I have never been one of those people. Working with Julien and Lucy really brought it out of me to be more prolific, so I am hoping to carry that with me from now on. Did you play to each other’s strengths, or were you trying to all do something outside of your comfort zone? LD: I think we played to each other’s strengths and we played to each other’s weaknesses too. I think that each of us has areas that we feel less secure in, and then the other two would come to the fore in that area.I don’t really like playing instruments but Julien is a really great guitar player and she plays mandolin, banjo, percussion and piano on the record. Occasionally we would be deciding on a lyric, and I have really strong impulses when it comes to words, so I feel that is what I may have had to offer – although Phoebe and Julien are also really strong at that. Whenever any of us felt like we were not on game, the other two were there to help out. If ever I had doubts the other two were there to compensate. JB: I’m not really sure what my strengths are. Maybe it’s for me to be able to move back and look at the whole and think about what it is that the song needs. Phoebe has a really good sensibility for creating moments, or when the turn of action in a song should happen. The meticulous and small moments that really make a song is her strength. Lucy has a really great ability to deconstruct things and then put them all back together in a very fluid way. So, it has me working on the macro and Phoebe on the micro and then Lucy has a skill of how substantiate how all of the pieces come together. PB: We are all excited to learn from each other which I think is a shared trait. We recorded at Sound City which is quite a famous studio as (Nirvana’s 1991 album) Nevermind was recorded there. There haven’t been many things recorded there lately as David Grohl bought the main console that was there. It is like a historical space, but it has been defunct for a couple of years. It felt like bringing a new project to a very old and established studio, so that was my favourite part of it. We were there for about 12 hours each day working our asses off. We made the whole thing in four days which is a very fast turn around. Who has the final say, or was that part of the beauty of having a trio? LD: We didn’t really ever disagree. The rule was that if we didn’t like something, then we would wait it out until everyone was happy with it. It wasn’t bad to say we didn’t like something. I don’t think any of us were offended by being asked to rework a part or to change one of our ideas. It was a largely ego-less experience and I really value that about Julien and Phoebe. I think it is really easy for people to get into the studio and people to have egos and want to make sure that the work represents their portfolio. I think that we had such low expectations, or maybe a low amount of pressure as no-one was thinking too far in the future and just thinking about what we were doing at that moment. JB: Being able to create in a space where we found that our capabilities were not questioned, gave us a lot more confidence to just produce and trust our creative instinct. Moving forward it will make me much more open to the value of spontaneity. I am a very meticulous person. It has been a while since I’ve been in a band and I miss that dynamic because it is so organic and the beauty is in the spontaneity. When I am writing my solo stuff, I am able to be as neurotic and meticulous and calculating as I want to be. Sometimes that is great and you can make a really focussed record with that, but sometimes it can be constraining. I am really glad that I have had this experience of spontaneity with boygenius. PB: We are all big personalities but no-one is a brat or a diva so it was just really fun in its purest form. LD: I think that it is a product of having less pressure. Bringing in another instrument can often feel like a really big decision. It is going to change your known identity. There are some instruments that are going to be called Americana no matter what – like a banjo or a fiddle. I guess you can work up reasons not to use those instruments, but this was the first thing that we had ever done together so it was a wide open field. We were keen to say yes to most ideas as we didn’t want to waste time deliberating, when we could just try it. Most of the time it worked. JB: It was neat, you can hear all of our distinct voices both vocally and with our style. I played a lot of the electric guitar tracks. I also played Mandolin, banjo and piano. I guess i did play a fair bit. It was nice to be able to explore bits of my musical knowledge that I don’t get to delve into too often because I mostly perform by myself. I don’t get to perform a guitar solo in a traditional way where I get to shred, so that was nice. PB: Julien played most of the instruments. She played banjo on Me & My Dog which was pretty sick. I play the baritone guitar which is a lot lower and sadder to me. I love sad stuff so it seemed like an obvious choice. I play it a lot more than most people. I don’t really have a guitar that isn’t a baritone. Julien, are you enjoying the change of pace where you get to talk about the making of the music instead of delving into the depth of your soul about this collection of songs? JB: I think that it is interesting because the meaning of the songs is something that I like to talk about because the songs’ most important quality is to be able to transfer emotion, so I don’t mind that. It is really another side of creation to be able to talk about the technical side. As a female there is an assumption that I am not as well versed in that side. That I create the raw material and then someone else is putting it together. That is the other thing with this project that it was important that we have minds that were not only creative but technical so as we didn’t just have talent that needed to be reigned in by an overarching force. The record hasn’t been met with the reception of “look at these three indie doe-eyed darlings who magically made a record”. People have been legitimatising the record in the way people have spoken about it and i have been pleasantly surprised. I think that is indicative of the very social moment that is moving.